Whale watching worldwide is increasing in popularity and belongs to the fastest growing branches of the tourism industry. Therefore, the numbers of cetacean populations exposed to commercial whale watching activities is growing rapidly. This leads to the necessity of guidelines in order to minimize the impacts on the marine mammals. At the same time only little relevant research yet exists on the topic of vessel-cetacean interactions in the Canaries. The results of our studies are applied ’hands-on’ in the elaboration of whale watching regulations. Moreover, they are embedded into a comprehensive concept, which connects whale watching tourism with both scientific research and with public education for marine conservation. In 2003 MEER e.V. published an extensive research report to summarize the results of the research conducted from 1995-2001, which presents the significance of these results for establishing a marine protected area (MPA). 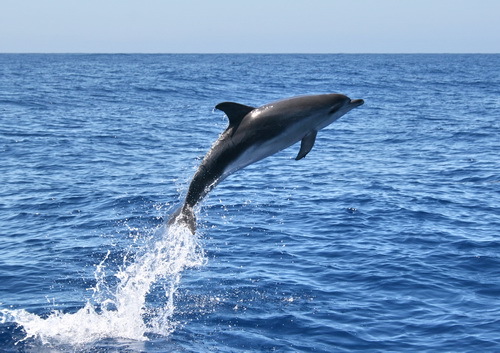 Thus amilestone has been laid: for the first time La Gomera’s cetacean species diversity of whales and dolphins has been highlighted on an international level. I the same report, the possibilities and means of a sustainable development of whale watching tourism have been described in detail – in shape of a model for an MPA especially designed for the sustainable use of cetaceans.